Destroyit 5009CC is an industrial shredder for shredding confidential documents. Destroyit 5009CC Cross Cut Paper Shredder is a HIPAA/FACTA compliant shredder used in industries for heavy shredding. Destroyit 5009CC can shred 600+ sheets at a speed of 46 fpm. Its features include an easy-to-use control panel with push buttons for forward, stop, and reverse, safety lock and key, main switch, and emergency stop button, automatic reverse and re-feed in case of paper jam, thermal switch that prevents overheating, optical indicators that show operational status, and two automatic speed modes: "Power" for bulk feeding large quantities of paper, and "Speed" for high speed shredding of smaller amounts. 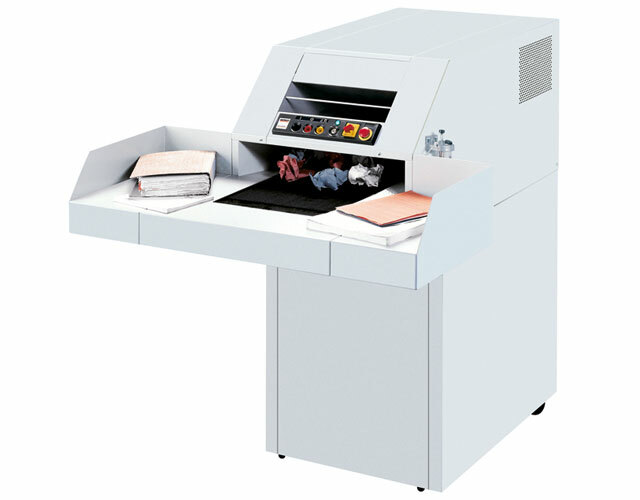 The Destroyit 5009's blades are high quality, hardened steel cutting shafts that are soft metal resistant and can shred CDs, VHS tapes, hardbound documents, and 3-ring binders. An interesting design is the placement of a convenient, centralized oiler for lubrication of the cutting head. The Destroyit 5009 is a powerful shredder that comes with a high powered 3 phase motor rated for continuous operation and durable gears enclosed in dust-proof housing. It is a large shredder with easy-access door located at rear of machine, and a pull-out bag frame mechanism mounted on rollers for easy replacement of disposable shred bags. If the cabinet door is opened or when the shred bag gets full, the shredder automatically shuts off. For mobility, it is mounted on heavy duty casters. The Destroyit 4605CC Cross Cut Shredder is perfect for heavy usage. Cut Size 3/16" x 1 1/2" to 3"
Dimension 67 1/2" x 40 3/4" x 85 1/2"